A large covered concrete patio features a Charcoal Smoker Grill and a Large hot tub. The Patio, the small back porch and the Dining area all have an open view of the lot and of Lake Hartwell. The full modern kitchen is complete with Stainless Appliances and Granite Counter Tops. The cozy living room features Cable TV and WiFi. (You may fish anywhere on Lake Hartwell with either a Georgia or South Carolina fishing license). Located about 6-1/2 mile from the Gum Branch fishing tournament ramp and about 7 miles from either Hartwell Marina or Big Water Marina. ** 2 STATE PARKS ** within 11 miles: Hart State Park in Ga is about 6 miles; Sadlers Creek State Park in South Carolina is 11 miles. OUR PRICES ARE ALWAYS EQUAL or LOWER: If you find the same house available the same dates, advertised at a lower price, show us the ad and we will match it. We accept any standard form of payment including most major credit cards. Always be wary of prices quoted on the internet that seem 'Too good to be true' ***************************************************************************************************************** RENTAL GUARANTEE: We automatically guarantee our rentals and you don't pay any extra fee. **************************************************************************************************************** NO SURPRISE CHARGES: Some agencies and/or owners have an extra charge for just about everything. Some even charge extra to furnish linens. With Mountain Lakes there are NO hidden mandatory charges. **************************************************************************************************************** OUR NO FAULT SATISFACTION PROMISE: Should you arrive and find that the home you chose it is not right for you FOR ANY REASON, we will arrange for you to transfer to another available home with no moving charges. All we ask is that you call us within 2 hours of your arrival. CLEANING FEES: Most rentals 'By Owner' add a cleaning fee of $50-$150, with Mountain Lakes the cleaning is always included in the published price. **************************************************************************************************************** EXTRA FEES: We have NO automatic mandatory charges. PETS: In many of our houses (But not all) you have the option of bringing along your pet. We do charge extra for pets. Generally the charge is $75 per pet plus tax. Pets are usually limited to two per house. Be sure to inquire about bringing pets to the house you are renting. AND please be sure to tell us that you are bringing a pet when you make the reservation. GARBAGE: We ask that you take your trash out when you leave. For many of our guests, it is routine to throw their trash bags in their boat when they are leaving the lake. If this is not convenient for you, feel free to leave the trash bags for the maid to take. If you do so, we ask that you leave the maid a suggested tip of $5 per bag. ***************************************************************************************************************** SALES TAX: Both GA & SC place the burden of paying Sales and Accommodations Taxes on the consumer, whether or not these taxes are collected by the Cabin Owner. We collect and pay these taxes so you don't have to. Taxes range from 7% to 12% depending on location and are INCLUDED in our posted rate. You will never get a bill “Out of the blue” for unpaid taxes on our rentals. We stayed here in January while our home was being remodeled. Despite temperatures in the low 20s F., we were quite comfortable inside. We were able to walk our Shih Tzu along the lakeshore during the milder afternoons. TV and WiFi were mostly reliable. The kitchen furnishings were adequate. 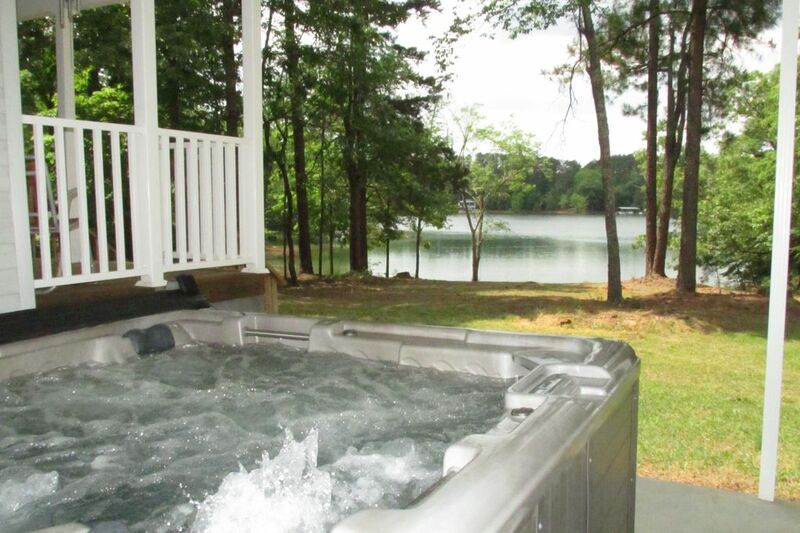 The master suite is exceptional.. We recommend this rental. We would enjoy staying there in warmer weather to participate in boating and fishing activities. One last comment: grocery stores, pharmacies, and a variety of restaurants are convenient, within 5 to 7 miles. Definitely peaceful place and nice!! May want to consider ceiling fans in the bedrooms. Excellent stay. You all were so helpful during a rough family time and were very understanding of our mess ups! Thank you so very much for being so flexible! This place was clean and came stocked with most essentials. The owner lives next door and was always making sure we had no problems. Great place for a fisherman plenty of room to store your boat in yard. Just wish I had time to use hot tub. This home is on a very beautiful and peaceful part of the lake. We had a little beach to ourselves and our 2 dogs for the whole day. The home was clean, the bed was comfortable, and the kitchen had everything we needed. Relaxing in the hot tub at dusk, with a view of the lake, as we watched a deer passing through the yard was a perfect way to end the day. We will definitely be back. 2 STATE PARKS within 11 miles: Hart State Park in Ga is about 6 miles; Sadlers Creek State Park in South Carolina is 11 miles.